PREPARED LESSONS - Students who come well prepared ENJOY their lessons! Establish a definite daily practice schedule. It should not be the last priority after athletics, school and social events. Remember, it is not how long you practice, but how well you practice. 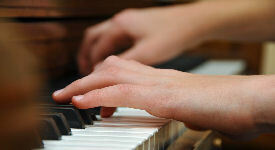 Please read "Getting The Most Out of Piano Lessons" under the menu item Keys to Success. ALL books are to be brought to each lesson, unless I specifically instruct you to leave it at home. Written work is to be completed before the lesson, or lesson time will be taken to finish it. The lesson assignment book contains a practice record which is to be filled in daily. Please come with well trimmed nails and clean hands. Gum will be wrapped and deposited in the "gum graveyard". Parents, be your child's personal cheerleader. Praise often and honestly! Provide the best piano possible. It must be well tuned and in good working order. The practice room needs to be pleasant, comfortably heated/cooled, with good lighting and free from distraction. Siblings need to respect this practice time. Create a family attitude that time at the piano is free of interruptions. Love music! Listen to the best available. Watch recorded performances together. We live close to cities of cultural opportunities. Attend performances whenever possible. A well tuned piano, metronome, music, "tuned in" mind and ears, and a DESIRE to learn! These are held approximately every 6 weeks and are free! Students have an opportunity to perform pieces that have been selected at lesson before an audience of their peers. This develops self-confidence and poise at the piano, and provides a learning atmosphere for recital manners as well as audience manners. Students receive motivation from their peers and build friendships through theory games. I also provide a short lesson of music history. Attendance is expected and strongly encouraged. All students will participate in a Spring Recital held in mid-May. Students are expected to be fully prepared to perform two weeks in advance. Please encourage your student to play and perform often, for friends, family, church, school etc. I will be happy to help them prepare for these special performances. Some students are invited to participate in the Gold Cup Festival held each spring through National Federated Music Club. There are nominal fees involved with this festival. If a student regularly misses lessons, a conference with the parent will determine if lessons will continue. Please call me if your child is sick or MUST cancel a lesson and a make-up lesson may be scheduled at the teacher's convenience. Regular attendance is necessary for consistent progress to be made. When a student is unprepared for any reason, it becomes even more important for him/her to attend the lesson. Students are expected to arrive on time and be picked up promptly. Tardiness results in lost lesson time. Please enter and leave quietly so that another student's lesson is not disrupted. A calendar of piano parties and holidays will be provided at the first lesson. If schools are closed due to inclement weather, music lessons are canceled for that day as well. We are in a partnership together...parent, student and teacher. We want to work together for the best experience in the study of music, the universal language. Parents, feel free to attend lessons, and if you have any concerns or suggestions, please contact me.